> Reviews > AgeMatch.com – Targeted at joining May-December Lovers, but does it? Agematch.com is another dating site that has another interesting concept. The whole idea behind this site is to specialize in “May-December” romances, whether that means young, women and older men or young men and older women. However, just because the couple has a significant age gap, doesn’t mean it’s a SB/SD arrangement. Despite the idea of it sounding like it might be rather advantageous, there are a few hiccups in this site. The language that has been used is so poor that you cannot really tell who has written it, but it’s certainly a turn off. This therefore made me give it a 2 Star rating. When you are actually signing up for the site its normally free for the basic account, where there are limited resources, and if you need to access certain services, you have to pay an additional fee in order to join the premium and other membership package options. The membership period comes in addition to more money, and hence the pricing is too high in this site to be worth the bother. Most of the time the amount of money that you are paying isn’t worth the service that you are receiving as you are likely to find there are a lot of scammers on this site. The membership fee can be paid using a credit card, check card, or through PayPal. When you are subscribing to this site you should be careful with the prices that are listed, as they change from time to time. When you actually get into these dating sites you expect your privacy to be a significant priority. However, this is almost invalid on the Age Match site. This is one of the major problems the people on this site experience. Linking various accounts with Facebook, like say Spotify, Instagram, or LinkedIn, can be beneficial or fun, however, linking your sugar dating site (or any online dating site, really) account with your Facebook page is a very bad idea for personal privacy and safety. It’d be nice if we could be sure that all the wealthy older Sugar Daddies on a site are real gentlemen and not pervy stalkers, but you can never be too careful online. This is a major issue as one can be able to see the other person’s additional information, which probably did not get put on their agematch.com profile. This is one of the major violations of one’s privacy on this site. The access to one’s Facebook page is a downside of this site, as it may make less people want to join it because of this privacy issue. At times when a user has joined a particular site and isn’t satisfied they tend to take their leave. Unfortunately, on this site, there are various issues that make it difficult for one to actually delete their profile. The site has 3 id numbers, but the two that you require for exiting the site can hardly be found. This makes it actually hard for someone who wants to leave the site as it’s almost impossible to find the number linked to your account. 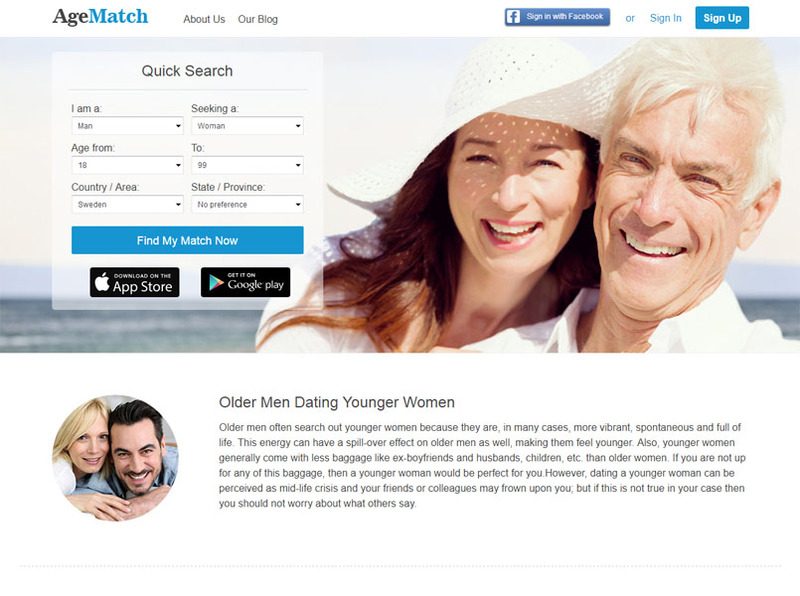 Age Match has various features, which are used on the site. For example, you can be able to send winks to show that you are interested in someone. These may be able to earn you a chance on a date. It, also, has a way where you can be able to view the people who have actually viewed your profile. There is an interesting feature on this site referred to as the ‘suggest a date’ where you actually give the day that you want to meet someone on your profile, which would be an intriguing and useful idea…. If it worked. The only really modern feature available is their mobile app, but with their crappy security and Facebook links, I wouldn’t want the app on my phone because it’d probably be grabbing all kinds of personal information. Age Match provides young Sugar Babies that are looking for an older Sugar Daddy relationship a chance to actually find one on this platform. However most of the guys that came up on my search results were average guys on this site only because of the fun. Most of them, however, do not have the ability to be a benefactor, hence they are only here because of the fun of hooking up with young and pretty girls. There are an inadequate number of truly rich potential Sugar Daddies on this site compared to the average men who only looking for a generic relationship with a single young woman only because she’s young with no kids. A large number of the Sugar Babies on this site are fakes, which means that legit Sugar Daddies don’t stick around. This is not new to these types of dating sites, as it seems to be the most critical problem they all go through. There are various types of scammers on this site, one of them is those women who have enticing profiles and most of the time their stories are full of lies. These scammers actually entice the wealthy Sugar Daddies and lead them on, thinking they want a relationship, until they’ve gotten the older Sugar Daddy to provide his contact info. That’s when they start spamming them with links for cam sites. Most of the guys here are just average guys who happen to be older men. They don’t seem to looking for an actual SD/SB relationship. Most of them are just looking for casual dating with no strings attached or a romantic relationship with no mutually beneficial arrangements. The Age Match dating site is just not the sugar dating site that I would recommend anyone to sign up for its membership. The site doesn’t offer much or anything interesting apart from specifying that they are helping set up the young to the old. If you are actually looking for a rich Sugar Daddy, you’re about as likely to find one here as you would on Tinder or OkCupid, but with less security, prompting me to give it a 2-Star rating.